Kejriwal accused Madhya Pradesh CM Shivraj Singh Chouhan of indulging in massive corruption and misrule. BHOPAL: Aam Aadmi Party (AAP) chief Arvind Kejriwal today called upon his party workers in Madhya Pradesh to prepare the ground for "uprooting" the "corrupt" BJP government in the state. Assembly polls are due in Madhya Pradesh in November- December next year. Kejriwal accused Madhya Pradesh Chief Minister Shivraj Singh Chouhan of indulging in massive corruption and misrule. The Delhi chief minister was addressing a convention -- the 'Shankhnaad Rally' -- at the BHEL Dussehra Maidan here. 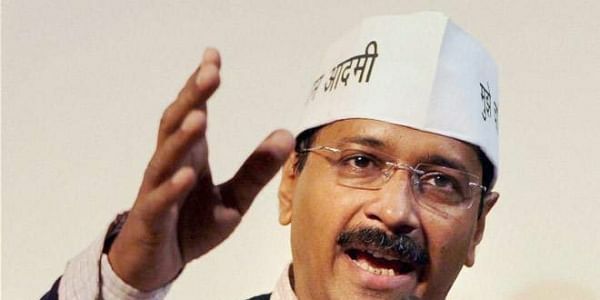 AAP workers, who had gathered from across the state, responded with a huge applause after Kejriwal asked them about contesting the 2018 state Assembly polls. "The BJP has been ruling Madhya Pradesh for the last 14- 15 years. The time span is sufficient for making a new Madhya Pradesh. But, can you point out a single achievement of Shivraj Singh Chouhan during this period," the AAP supremo asked the gathering amid slogan shouting. He claimed that all the sections of the society, including teachers, farmers, students, women, traders, scheduled castes (SCs), scheduled tribes (STs), were facing problems in the state. "Shivraj sucked Madhya Pradesh like a mango. What is happening in Madhya Pradesh was happening in Delhi as well. But, the situation there has changed now. "The power tariff in Madhya Pradesh is the costliest in the country, despite it being a power-surplus state. On the other hand, the Delhi government purchases electricity from Madhya Pradesh and supplies it to the citizens at one-third of the rates in MP," Kejriwal said. He added that while the electricity bill for 200 units would come to Rs 1,370 in Madhya Pradesh, it would be for Rs 462 in Delhi. Taking a swipe at Chouhan over the Vyapam scam, Kejriwal said Madhya Pradesh had earned notoriety for the entire episode and added that 40 young people were killed following this massive corruption. "The young students, aspiring for a good life, were killed in the Vyapam scam, though officials and leaders were responsible," he alleged. Kejriwal claimed that corruption had reduced in Delhi after the AAP government took charge. "A report of the Central Vigilance Commission (CVC), an agency of the BJP-led central government, has said that corruption has reduced by 81 per cent in two-and-a-half years in the Delhi government, while graft has increased by 67 per cent in three years in the central government," he said. Claiming that the success rate of the students of government schools in the national capital had gone up compared to the private schools, Kejriwal said, "If you want cheap electricity, good government schools, health facilities and a corruption-free Madhya Pradesh, you will have to fight." Referring to his government's achievements in developing the school infrastructure and in the health sector, the AAP leader sought to know that if Delhi could be developed in the last two-and-a-half years, why was Madhya Pradesh not developed in 14 years. He said the BJP and Congress were hobnobbing with each other in Delhi, where the people had found an alternative in the AAP. "The work done in Delhi in the last two-and-a-half years has never happened in any city of the country in the last 70 years," Kejriwal claimed.